Montreal’s Run to End Poverty (R2EP) is this Sunday. This blog entry is part 2 about why I’m running. Part 1, which gives context, can be read here. To donate to my R2EP campaign click here. So, what do you do? You work on the system, and you work on the attitude. When I went back to Burkina Faso in February 2011, I was most excited about young leadership development, and Ibrahim was on my mind. Bolstered by the vision of African leaders who attended EWB’s national conference, it became my vocation to bring to Burkina universities the spirit of what drives EWB in Canada – passion for positive change, critical thinking about development, hope for a more just world, belief that change is possible. But… at my first leadership workshop at the CAP/M most of the 40 students attending were looking at me pretty funny as I expounded on a definition of leaders as being agents of positive change. Poor, crazy Toubabou. Ibrahim, however, was paying rapt attention; as I later found out, it was mainly because he completely disagreed with what I was saying, but had come to think I should be taken seriously. Ibrahim was the first – and only – person to show up at the first “team meeting” that followed that workshop. It was discouraging, but it allowed us to have one of many deep conversations about why I did the work I did. More importantly, through talking with him, I began to understand just how hard a worker Ibrahim was. In the past, he had wanted to be a rural development engineer. He had twice unsuccessfully applied to the Rural Development Institute (IDR, where I also worked) and instead ended up studying to be a science teacher. He was drawn back to the agricultural sector because he thought he could truly have an impact on his country there. His plan: while working as an extension agent, simultaneously obtain a Master’s degree and subsequently a PhD. What I came to understand about the “There aren’t the means to do our work” I had heard months earlier, was that it did not mean, by any stretch of the imagination, “I will sit around doing nothing and take in my salary.” No. It meant “I will work as many hours as I have to every week, to unearth every opportunity, achieve my goals and raise my family.” That’s also when I found out that Ibrahim was 29, married, and expecting a child. Before my work facilitating leadership development in universities, EWB’s program focused only on individuals: taking them as 1-year interns into our Burkina team and providing them with a unique work experience, intensive professional development and an opportunity to see their potential for having positive impact. Nasser Zongo, Idrissa Nacambo and Hermann Naré are young Burkinabes who I had come to truly admire for their optimism, hard work and determination. I had also seen how working in a team that matched their determination and invested deeply in their capabilities allowed them to grow without restraint. I aspired to give students at the CAP/M the same opportunity. And so the case was made: not only would we have “Leadership Clubs” that aimed to give students their own “system” at the CAP/M where they could develop as leaders, but we would also take on a short-term intern to exemplify what it meant to be a change agent. Out of 20 written applications and 8 interviews, Ibrahim was finally selected – by a landslide. And from that point he never stopped. When asked, during the group interview, to choose which EWB value most resonated with him, Ibrahim chose “Dream big, work hard.” For the next 4 months, that is exactly what he did. On the field nearly every day, evaluating the effectiveness of one of our partner’s CEF program, which aims to help farmers manage their farms effectively and entrepreneurially, Ibrahim has spent his few days off synthesizing his results or reading about development. While on our team, he has taken absolutely every opportunity he has had to learn anything and everything about what makes good development, communication, computers, leadership, and more. Like our other interns, he has become an inspiration and a model to our team. He is even extending his placement with us by another 4 months, acting as a model and guide to members of the new “Leadership and Development Club” at the CAP/M. Before I left, Ibrahim introduced me to his family. I met his wife, his mother, his brothers and his friends. Lastly, one week premature, baby Aziz showed up just in time for my departure. It was truly something to become a new uncle, in a family thousands of kilometres from my own right before coming home. To his new-born son and his wife, Ibrahim introduces me as someone who changed his life. But all I did was find him. Truthfully, it was he who changed mine. Currently, your donations to the Run to End Poverty Montreal are giving Ibrahim and Hermann the opportunity to extend their placements with EWB by supporting our leadership program. To donate to my campaign click here. If you’re an R2EP runner, you can hear from Ibrahim yourself when he skypes in at our Saturday BBQ in Parc Lafontaine, corner Calixa Lavallée/Rachel (1pm). With the end of my placement around the corner, time has accelerated and the amount of things to get done has increased exponentially. Sadly, that means it’s been a bit difficult for me to find time to communicate. On top of that, when I was hearing bullets flying in the distance from my backyard when the military mutinies made it as far as Bobo, it didn’t seem like a very good time to be talking too much about what was going through my head (it’s okay, things are completely calmed down now). That said, sorry for the long hiatus. Unfortunately, the end is closer than ever and that means all the more things to finalize. 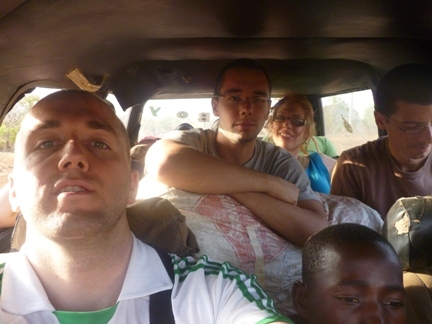 Still, I had a few pictures lying around, so I figured I’d post at least a little something to let you know I’m alive and kicking and give you a taste of what getting around is like in Burkina. or zigzagging back and forth, avoiding a full-frontal fuss. Lanes are really more of a suggestion here, and that's when they are considered at all. In this picture, my taxi driver had engaged in a bit of a game of chicken with the car in front. Although motorcycles are put on buses all the time, I've unfortunately yet to see someone fly off the top of the bus matrix-reloaded-style. It's pretty common for people to ride on top as well. … by what you found inside. 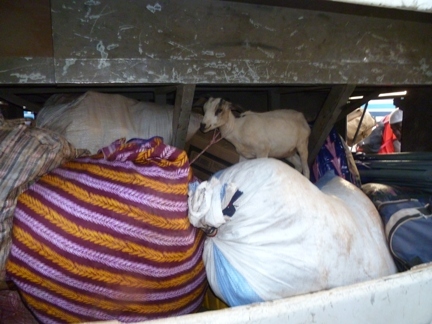 Animals inside and on the bus is also pretty common, but I didn't see them in the baggage hold like this too often. After my 5th flat tire on the 10 km road that separates Bobo from the college, I got angry at my bike and put it away. It's still looks up at me sadly from time to time, but I haven't yet forgiven it. The washer and dryer here would be those two buckets. but at least you can be pretty sure that they aren’t going to blow! 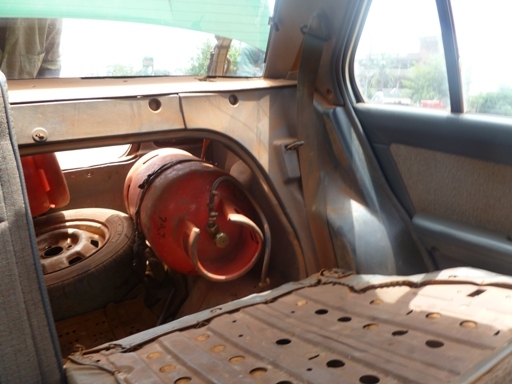 I saw this "gas-tank-in-the-trunk-and-connected-to-the-engine-with-a-hose" set-up only twice. I think it was enough. Admittedly, this isn't a particularly bad case of a cramped car... in the really bad cases, I'm not really able to reach my camera. The insides of doors aren't so devoid of coverings like this one is here too often, but a missing handle or a cracked window is par for the course. but I still didn’t expect that when in the trunk, the seats would do the sitting! Since my bike gave up on me, getting back from the college (center) can be challenging. Once, I had to ride on the back of the pick-up truck pictured in front, underneath that mountain of chairs. ... 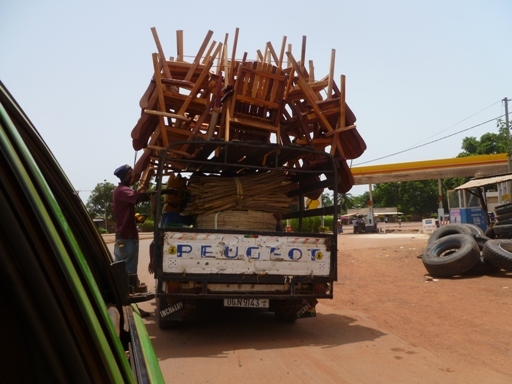 Okay, for those few of you that I know are waiting for it: In Burkina -- Chair sit on you!!! Sorry for the hiatus, I’ll try to have a few more posts up before I get home. Thanks for reading my terrible non-poetry! Qu’est-ce qu’un leader? Quels sont vos rêves pour le Burkina Faso? Pour vous? Une petite vidéo sur le programme de leadership burkinabé. p.s. La citation à la fin est traduite de l’anglais et je sais que j’ai commis une faute — mais il est difficile pour moi pour l’instant de la corriger. Ça viendra! This is the final part of “Hints of a Revolt”, an entry describing the recent unrest in Burkina Faso. You can start reading the entry here or read the previous part here. I recommend that you follow them chronologically before starting this one. 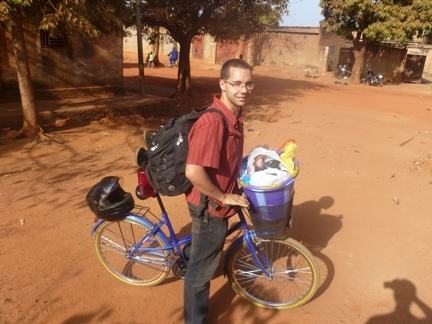 Please rest assured that everyone on the EWB team in Burkina has been and remains safe and sound. Protests haven’t stopped outright. About two weeks ago, following in the footsteps of their military brethren, the police realized that they could get money by shooting their guns. It seems to have worked. In the meantime, students are still demanding more transparency in the death of Justin Zongo, but it is generally believed that it is only some opportunistic troublemakers (probably not even students anymore) that are still being destructive, and only on a small scale at that. Lastly, at the end of April, the opposition parties made a tremendous fuss about a peaceful protest intended to “take every measure necessary to demand the immediate departure of the president.” It brought together 1000 people and did little more than garner the scorn of Burkinabe internet commenters. The general feeling is that the opposition is being opportunistic rather than constructive, taking advantage of a crisis to demand something that will set the country further back rather than help it in the current climate. People aren’t too happy with Blaise, but they trust the opposition even less. It seems like the unrest, so to speak, has temporarily died down. However, it is evident that the crisis lives on. A coalition exists, “La coalition contre la vie chère,” defending the interests of government employees from all walks of life. In Burkina, the government is practically the only formal employer and there are no big businesses to speak of, so this coalition represents pretty much everybody who has a job in the formal sector. Its claim: life in Burkina is too expensive, salaries are too low. It’s true. My host father says the government’s job is simple: just stop keeping the money for yourselves, raise salaries and control the cost of living. It seems as though most people repeat the same slogan. It’s as easy as that. The first is that they are right in denouncing a certain measure of corruption, in claiming that money tends to stay at the top and is not very well spent. The second is that this magical money they’re talking about just isn’t there, at least not in the amounts they believe it to be. This oh-so-simple job of just giving this miraculous wealth to the deserving people, appears grounded in an intractable belief that money is generated from thin air. 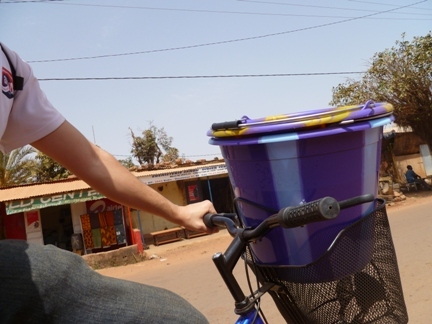 From beginning to end, the events of the last two months have convinced me more than ever that encouraging entrepreneurship, reinforcing the structures which can bring it about, and supporting the tools that can help develop it, are objectives that directly address one of the most fundamental causes of poverty in Burkina Faso. More generally, my belief that investing in a new kind of pro-active leadership is essential to Burkina’s development has been cemented. Even if working on it keeps me up on nights like April 15th, it’s also what gets me up in the morning. … but things are just getting good. Hello readers! Here is the 4th installment of “Hints of a Revolt,” (describing the recent unrest in Burkina Faso). You can read the first part here, the second part here and the third part here. I recommend a chronological read-through. As I laid in bed the night of the 15th, I think I heard a dozen rifle shots, at least three machine guns going off, protest chants in the streets, heavy military vehicles rolling by… Sweat dripping, heart pounding, I knew that this was now IT. Mutiny had spread to Bobo, and tomorrow, in the middle of my workshop, the presidential loyalists would be coming to put me away for instigating the revolution. No way I was leaving the house tomorrow! My barricading options seemed pretty decent: my room is separate from the main house but is made of bricks and cement, the window is already blocked off and my door is made of metal with a pretty sturdy deadbolt. Food would be an issue but thirst would undoubtedly come first. Still I had a fan to keep cool and my litre of water would last at least a day. At 5 am, I tiptoed outside to go to the bathroom. It was pretty quiet… didn’t really feel like there had been a revolution overnight. And then, all of a sudden, I heard the familiar sound of a gunshot. Except it was a door closing. Machine guns, except they were passing motorcycles. Protest chants, except it was the television, which had been left on late last night. And it occurred to me that at least one big truck carrying goods to and from the local market passes the house every night. No, the major challenge today would definitely not be avoiding the presidential guard, but rather giving a 4-hour workshop on less than two hours of sleep, being very careful to add the words “of positive, constructive, collaborative, NON-REVOLUTIONNARY change” every time I used the word “movement”. The activity went well. No revolts took place and Bobo-Dioulasso was as calm as ever. A few days later, a new prime minister, Luc Adolphe Tiao, was appointed, and the presidential guard gave a public apology during which they discouraged their peers from further destruction. Finally, a new government was created (reactions here). As many had deemed necessary, several old (and purportedly corrupt) heads were cut as the government fell from 38 to 29 ministers. The general consensus: it could have been a lot better (if it had been smaller and brought in more new blood), but it is a vast improvement – Blaise and his new prime minister are showing signs of wanting to truly address the crisis Burkina Faso is facing. Since then, the military wages have been increased in response to demands, reimbursing the merchants has been made a top priority and dialogue has been opened with the students. Things are looking up. Sometimes, living in Burkina Faso is about developing leadership in the hopes the work you do will lead to real change and an improvement in people’s lives. Anyway, the other night, Rahim was flipping around. Boulai apparently got in his head that the time for half-measures was over. With everyone already outside, without warning he came running out the door and tried to flip. He… did not succeed, and ended up face first on the floor. Evidently, he started crying. I don’t know if it was the particular motion he made as he fell, or the fact that everyone saw it and immediately knew exactly when and how he would start crying, or if it was just some sort of vindication for the 1-month plus Boulai has spent torturing everyone with his unceasing cries for no reason, but there was just something magical about that moment. I know I shouldn’t have, but I honestly laughed so hard that I cried… and so did everyone else. Don’t worry, Boulai was fine (well, as fine as he ever gets) — he didn’t really fall from very high. And I know, I’m an inhuman monster. But knowing is half the battle right? Hi everyone! For those following closely, I’m really sorry, I thought I’d make it to the end of the “Hints of a Revolt” entry in 3 parts, but it looks like it’ll be 2 more (shorter, bite-sized) parts + an epilogue. Hope you still enjoy this format (and please let me know if you don’t). I’ll make up for it by posting them quickly: the next parts will be up by Thursday and by next Monday at the latest respectively. Along with this post, I’ll see if I can share a funny little video to lighten the mood. In any case, here is the third part of “Hints of a Revolt”, an entry describing the recent unrest in Burkina Faso. You can read the first part here and the second part here. If you haven’t read the first two parts, it is highly recommended that you follow them chronologically before starting this one. 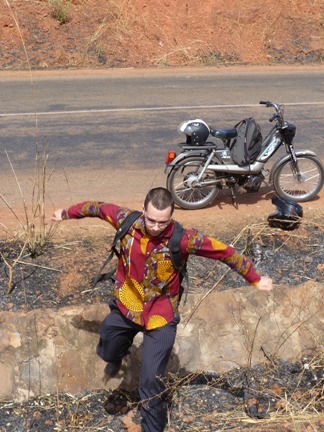 Please rest assured that everyone on the EWB team in Burkina has been and remains safe and sound. As of March 30th, the Centre Agricole Polyvalent de Matourkou (CAP/M, or what I often refer to as the agricultural college) was closed for a 45-day-vacation. The centre follows what might seem to Canadians like an odd holiday schedule, with major vacations being split into two: 45 days April-May, and then a month in the fall. As luck would have it, the student strikes had just ended, meaning that the polytechnic university (my other partner) was back in action. So, on to l’Institut du Développement Rural (IDR, basically the Rural/Agriculture-Engineering faculty of the university). My job description at the university is pretty similar to the college, with leadership development being my highest priority. After a planning meeting with the assistant director, my first leadership seminar/workshop was scheduled for Saturday, April 16th. Leadership in Burkina Faso (and I suspect, much of Africa) is mostly perceived as being limited to those in control. There are basically two types of visible leaders in the public arena: political ones, who (apparently) call the shots, and union-type (syndicats) leaders, who ask for better conditions and more money from the political ones. Hierarchy, both traditionally and now systematically, is very important. Unless you can work your way up the ranks and be a major decision-maker (and there is a very limited number of ways in which you can do this, most of them having nothing to do with leadership), you’re not considered a leader. Leadership is about committing to creating positive change and doing it, not ordering people around. How you do it is up to you. No more complaining; start creating – commit now and create a movement of positive change. In effect, it’s putting into practice my favourite quote, which sits permanently on the right-hand-menu of this blog. Two nights before the scheduled date for the workshop, mutiny struck again, hard. The president’s own guard shooting in the air wildly. The rest of the military following suit: stores looted, stalls destroyed, millions of dollars in damages, some rumors later went so far as to say women raped… Realizing the magnitude of the crisis, President Compaoré dissolves the government and names a new chief of the armed forces. … Wasn’t dissolving the government one of the first things that happened in Egypt? This is the 2nd part of a thus-far-three-part entry describing the recent unrest in Burkina. The first part can be found here and should definitely be read first for the following ones to make sense. 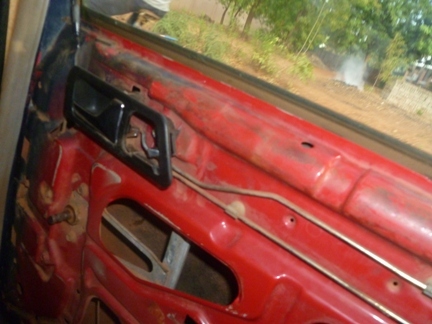 Depending on how things evolve in Burkina Faso over the next couple of weeks the third part may or may not be the last. A French retelling of the events from a different perspective and with some background can be found here, on my friend Bernard’s blog. 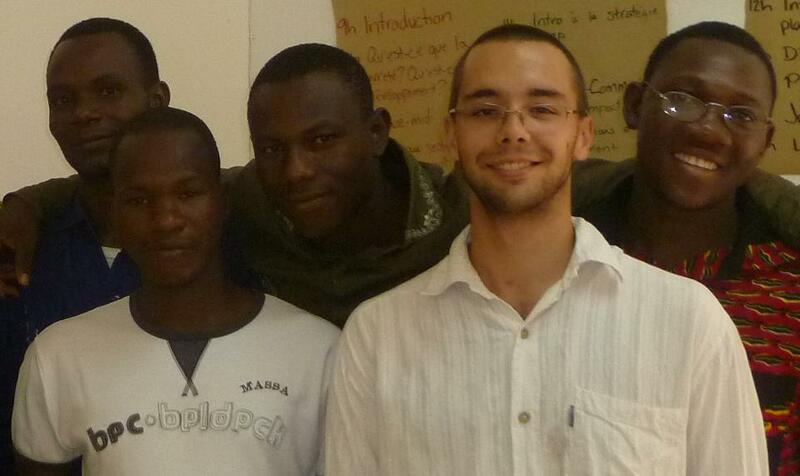 Please rest assured that everyone on the EWB team in Burkina is currently safe and sound. On March 23rd I left Bobo-Dioulasso to head towards Ouagadougou on my way to Ghana for the West African Retreat, lovingly called the ‘WAR’. The WAR is when all of EWB’s volunteers in Ghana and Burkina Faso come together for a few days, and we even get a few special guests from southern Africa and Canada (The WAR is not, as perhaps its name might lead you to believe, a trip to the Ivory Coast to experience war first-hand). It’s a time to look back, look forward, work hard and reenergize. I was really looking forward to it. Students were still on strike, but things had calmed down. 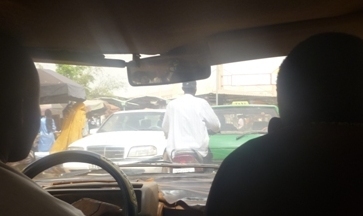 There were no more protests and both Ouagadougou and Koudougou – which had seen the most action – were safe. 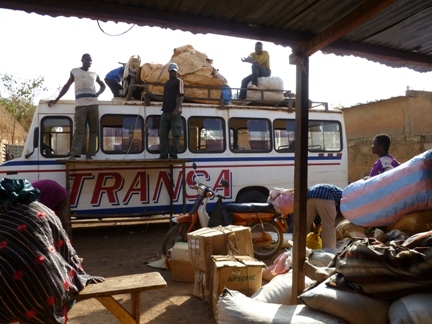 I was on my regular Bobo-Ouaga bus, having just passed the halfway mark at Boromo, when I received a call from Florian, our EWB team director in Burkina. “Don’t come to Ouaga. There has been a minor military revolt. It’s not too serious, but we’ve moved from ‘Conscious’ to ‘Alert’ in our emergency plan and are monitoring the situation closely. If possible, stay the night somewhere near Ouaga. We’ll see what’s what in the morning and see how to get everyone to Ghana then.” So, ironically enough, I stayed the night in Koudougou. There, I met up with Rosanne (another volunteer) and her husband, who were in the same situation. The next morning, the coast was clear, so back to ‘Conscious’ and on our way to Ghana. There were some small demonstrations that almost made us late for our bus, but other than that nothing to report. So, after a long trip, a quick stop at the border for some amazing sausages and Ghanaian bread, and a personally very trying ‘holding-it-in’ taxi-ride, we made it to the farming training centre in Bolgatenga. We had barely noticed the as-of-yet empty camps set up to receive refugees from the Ivory Coast coming through Ghana towards Burkina. That evening, Rosanne gave her husband a call to see how the situation had evolved. It wasn’t good. More military protests, shots fired in the air, someone may have been seriously hurt. I don’t remember anyone making jokes about the now aptly-named ‘WAR’ that night. The WAR went by quickly and by March 29th I had made it back to Bobo safe and sound and I was getting ready to give a course the next morning at the Matourkou agricultural centre. 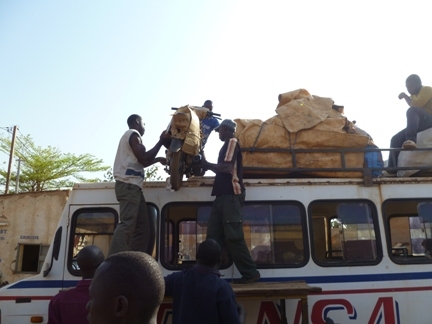 I’d be taking the morning teachers’ bus to Matourkou, where I’d then stay for the next few days. 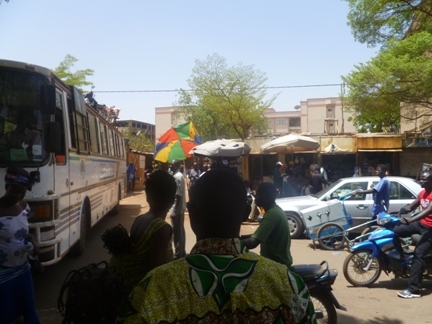 In between times, the worst had passed in Ouagadougou, but there was still some notable military activity in Fada, a little bit outside of Ouaga, and in some other towns like Banfora, about an hour away from me and where some minor military/civilian fighting had occurred . Bobo, along with Dédougou, had been the calmest of all major cities throughout all the events, so I felt pretty far from it all once I got back, though it did feel a bit more serious to now have activity on both sides – Ouagadougou in the East and Banfora in the Southwest. Still, I gave class and was much more concerned about the fact that, because of various organisational issues, pretty much nobody showed up, rather than by my own safety. And then rumour spread on the campus that the teachers’ bus had been stopped by the military on its way back to Bobo that afternoon. The teachers had had to get out and find their own ways back to their homes. The bus had come back to the college. That would be the same bus I was on in the morning. So, Bobo too. That evening, the government declared a curfew in effect for the whole country. Everyone indoors from 9 pm until 6 am. Word from the embassies: avoid Ouaga, Bobo, Fada, Gaoua. Val (my coach and our director of human resources) was supposed to come facilitate an ‘interview day’ at the college with me on April 1st and there’s no way I could do that alone. Yet 8 internship candidates, students from the college all hoping for a short-term 4-month position with EWB, were depending on it. It was very important to me that we not let them down, but with the current state of things, it didn’t look like Val was going to make it. Events were becoming real. Except, the next morning all the teachers showed up, with not a worry to share. The story goes that it wasn’t the military that asked them to get off the bus but rather a bit of a fear-monger who had seen some military activity and assumed the worst. In actual fact, the teachers now said, it was just a misinterpreted training exercise and they were just annoyed with the disturbance more than anything else. To this day I don’t know what the truth regarding that incident was, but Bobo was again open for business that evening and Val made it to the college without incident. By April 3rd, nothing else significant had happened and the curfew was lifted. The student strikes had also ended about a week earlier. Things were back to normal and I saw no reason to expect they wouldn’t stay that way. Ignorance. Indifference. Apathy. In December, these are the words I would have used to describe how Burkinabes felt about politics. An election was held in November to which everyone knew the outcome before the campaign even started. The news of tensions rising in the Ivory Coast was far more interesting, far more relevant, far more important to the average Burkinabe than their own politics. Here, nothing was going to change; nothing could change. The first hint came on my second day back in Burkina Faso, an unheeded passing remark by a colleague at the Ministry of Agriculture: “Blaise needs to be careful. The new generation has given him a pass for the last time. At the next election, he has to go. No more bending the rules.” I was surprised. People kid around about the 23 years President Compaoré has been in power, about the not-so-convincing reports of progress, about the not-so-true fact that Burkina Faso is an emerging country. But that’s just the way it is; people go with the flow. So it seemed. Then Tunisia happened. And Egypt. And Yemen. And Libya… And then things escalated in the Ivory Coast. As I sat in the shade in Dédougou on a calm, sunny, lazy day in Burkina, preparing for my meeting with my new partners, it was difficult to imagine the same thing happening here. Yet, my first meeting with the Directors at the agricultural college (Centre Agricole Polyvalent de Matourkou, or CAP/M) had a surprise in store for me. “So I see my placement in three parts: working with administrators to support some management issues, working with teachers on curriculum change and working directly with students on leadership development.” After seeing the energy of students at EWB’s 10th and biggest national conference ever, it was that third point which had me truly inspired – creating a movement of student empowerment, positive change and hope, right in Burkina. “Sounds okay, here are a few points: 1) We don’t want you to focus too much on the administrative stuff, 2) here are the teachers you should probably work with for curriculum enhancement and 3) we don’t want you meeting the students without supervision – we don’t want any movements, like the rest of Northern Africa.” My reaction: “Are you serious! ?” My answer: “Of course, no movements. Just leadership development.” I thought they were nuts. *Because of its professional nature, its belonging to the Ministry of Agriculture rather than education and its relative remoteness, the students at the CAP/M did not go on strike and my work there continued more or less unhindered. p.s. Sorry for not posting in so long. I had a slump followed by a high point that was also extremely busy. I’ll try to be better!